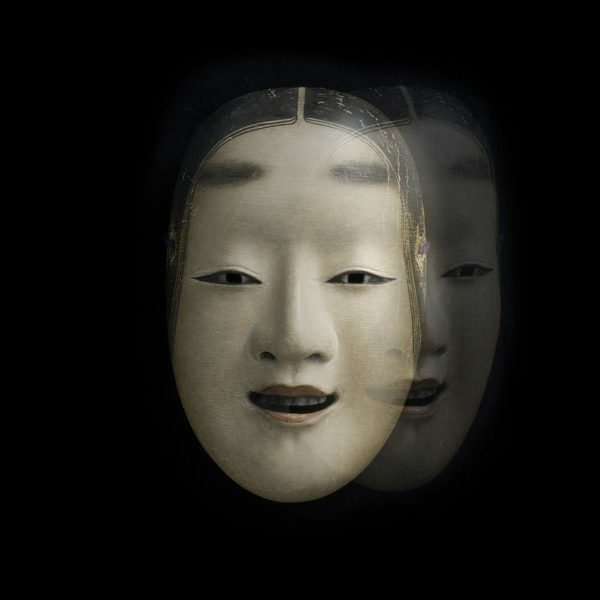 Noh theater invites spectators into an ethereal world. Through hypnotic flute and drum, trance-like chanting of poetic libretti, and fluid dance movements of spectacularly costumed actors, noh transforms the everyday to reveal glimpses of a world beyond. From the supernatural to the deeply spiritual, the realm of noh is at once magical and sophisticated, quiet, elegant and abstract. It is the effect of enigmatic masks and oversize costumes of precious brocades that heighten the sense of the extraordinary, altering audiences’ perception of reality. A history of theatrical styles preceded the emergence of the lyrical dance-drama known as Noh and informed its development. A tradition of ritual shrine dances & songs was already well established by the 14th century for eliciting blessings from the gods; comic, impromptu entertainments by itinerant performers celebrated harvest and planting seasons; concerts in the courtly milieu of aristocrats offered a sense of Chinese refinements. 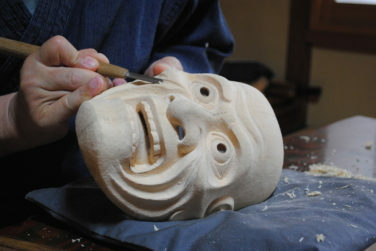 Merging these strands into skillfully adapted tales from the historic and legendary past by troupes of actors donning masks came to be called noh, meaning “accomplished,” to distinguish them from other, more improvised, entertainments. During the Muromachi period (1392-1573), the shogun Ashikaga Yoshimitsu advanced the status of noh through his patronage of the actor Kan’ami (1333-1384) and his son Zeami (c 1363-c 1443) who performed, wrote plays and put into writing ideas about the art of noh. It was Zeami who conceived of noh as y, an elusive, quiet beauty that permeates the style of theater known to this day for its austere stage and poignant masks. These and the many layers of exquisitely embroidered or brocade costumes imbue the actor with an oversized presence as he moves, seemingly floating, with the music and chanted narrations. It was also Zeami who removed the action of noh theater from the daily life of the romance or the war tale, and transported it into the realm of dreams. What takes place on stage portrays what lies behind the outward strivings of the mundane, and focuses primarily on the emotional interior. This world of introspection is expressed through a language of literary refinement, complex so as to draw each audience member into his or her own private sensibility. A typical play introduces a principal, masked, actor as a wandering priest or traveler. This protagonist may encounter a peasant or tradesman who offers shelter in a humble abode. While asleep, a dream reveals a tormented past or hidden truth that releases him or her from the shackles of illusion, and leads to a cathartic change that sets the character free, enlightened so as to return to daily life without what had been a spiritual load. 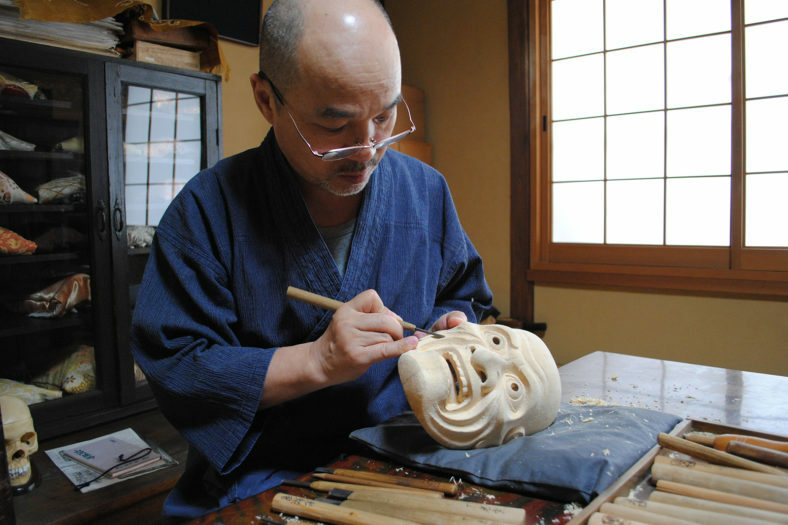 The popularity of noh has risen and waned through the flow of Japanese history. After its inception during the Muromachi period and its continued patronage by the military elite of subsequent eras, the study of noh libretti became a cherished pastime, nearly de rigeur among the literati and prevalent even among widening numbers of literate commoners. But when the old order succumbed to modernization during the Meiji period (1868-1912), noh was one of the traditions at risk of being left behind. It is interesting to note that in 1879 when Ulysses S. Grant visited Tokyo as part of his worldwide goodwill tour, his Japanese hosts arranged for a performance of noh to entertain the retired general and former US president, apprehensive, no doubt, that he would find its pace dull to the point of torpor. 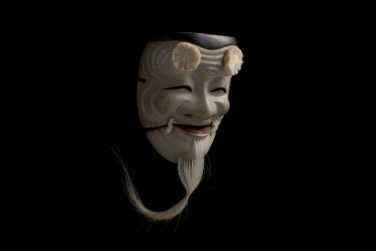 Instead, a record of the event shows that Grant expressed great admiration, and remarked to his hosts, “You must preserve this.” It remains today one of the world’s great performing arts, stunning to view, hypnotic, and capable of confounding normal perceptions to the degree that everything seen after experiencing noh appears in a new way. 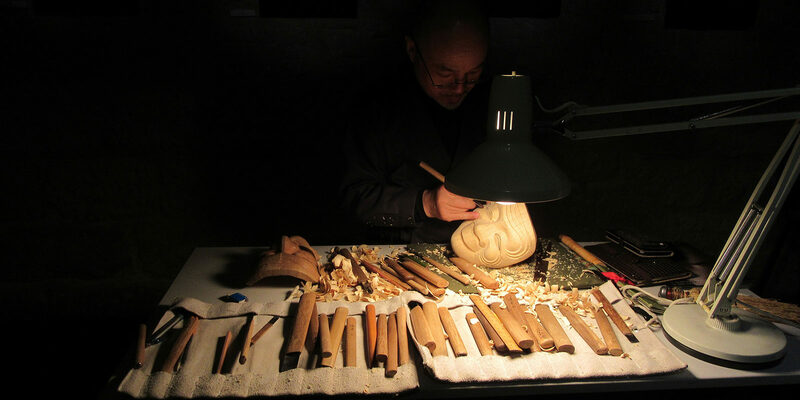 For our third exhibition of this year’s Art in the Garden series, the Portland Japanese Garden is thrilled to feature the Noh masks of Ohtsuki Kokun.